CLAYTON, NC – This past weekend, the Clayton Rugby Football Club hosted their annual End of Season Banquet and Awards Presentation for their members, families, and fans. As part of the festivities, the club presented a number of awards to players, coaches, and admin staff for their performances during the 2016/2017 playing season. The Clayton RFC is proud to carry on their traditional awards while also creating new awards. Having joined the Clayton RFC at the beginning of the Fall season, the New Zealand native immediately made an impact on the backline with his clean lines and leadership. Despite a mid-season injury, Russell appeared in eight matches for the 1st XV this season and was tied for 3rd on the team with five tries scored. Morrison joined the club in the Spring of 2016, but played his first full season in 2016/2017. An imposing figure on the pitch, Morrison made huge strides this past season and became more active on the offensive side of the ball. Headed into the upcoming playing season, Morrison is expected to have a break out season with more experience under his belt. This season is the first time the club has presented this award as it was given by Bootlegger’s Head Coach Rich Munro. 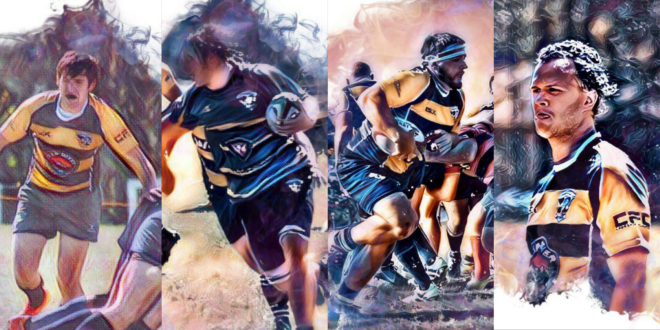 Spinnati took home this first-time award after bouncing back from a broken arm in the Fall to work his way into the 1st XV lineup during the Spring season. This non-annual award is presented to the club member that goes above and beyond in their service to the Clayton RFC. Club Board Member and award namesake Philip Davies presented the award to a surprised Club President Ted Hardy. Hardy has played a large role in the growth of the sport of rugby in Johnston County and continues to be a driving force as the club pushes towards the groundbreaking at their new facility. Head Coach Rich Munro was also presented with a signed ball from the players for his continued dedication and service to the Clayton RFC. One of the hardest working men in rugby, Munro not only coaches the Bootleggers, but also finds time to coach Middle School rugby and is a constant presence at club functions and community outreach events.